My stomach is in a flurry of nervous excitement. I always get that way when I’m about to take flight, so to speak. This holiday long weekend I’m heading to my most favorite city ever, Portland, OR with a pitstop for sleep & breakfast in Seattle, WA. I love roadtrips!! I’m excited because we’ll be visiting with my very best friend, Kyla & her sweet husband Sergio for some much needed belly-laughing, beer-drinking, game-playing, thrift-shopping and of course, eating. Fun times definitely ahead. Road trips to the US of A usually involve foods not meant for daily (or yearly) consumption. Things like “Chicken Fried Steak” or “Biscuits N’ Gravy” don’t even exist on Canadian breakfast menus, so as tourists, we of course must oblige in the artery-clogging good times. All of this “local colour” requires a bit of preparation before-hand. Lots of greens and tofu and fresh vegetables are more than needed, so I’ve fashioned myself a lovely salad that lends itself to variation. Why have a meal that consists of a bit of protein, some vegetables on the side and a bit of salad when you can combine everything into one bowl as the real deal? Easy! This salad is great because it tastes like springtime even in the dead of winter and there’s some nice contrasting textures because some of the vegetables are raw with bite and some others are steamed and yield nicely to the tooth. Perfection! Like I said, this recipe works wonders with most vegetables. Play with what you’ve got on hand and personalize it with what you like best. I think some cubes of feta cheese or some avocado or steamed broccoli would taste great here. Enjoy! 1. Steam the green beans, until bright green and still crisp. Plunge into an ice bath until the cooking process has stopped and the beans are cool. Repeat process with the cauliflower. 2. 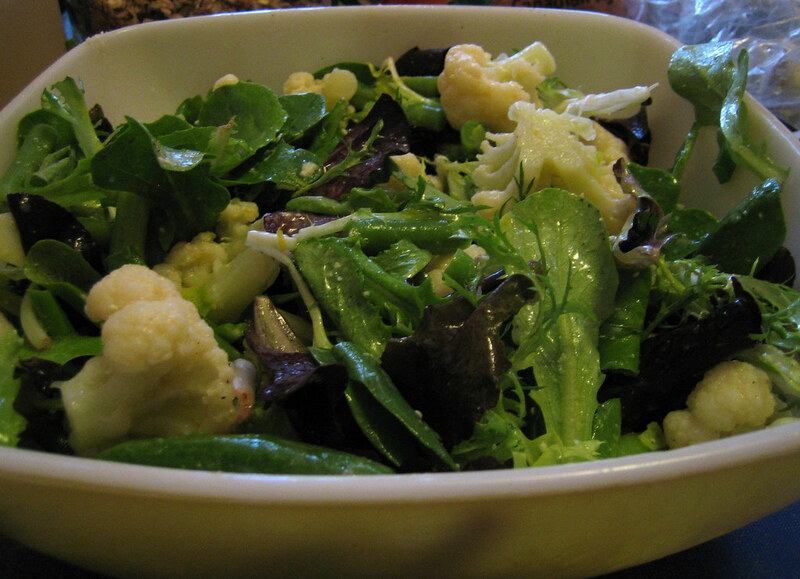 In a large salad bowl, add the greens, dill, chickpeas and the cooled cauliflower and green beans. Toss until everything is well distributed. 3. Make dressing. In a measuring cup, add the lemon rind and lemon juice and add the mustard. Mix. Add an equal quantity of olive oil plus a bit (I’m not the most scientific here, but let your taste guide you) and add about 1 T or more of water. Add salt & pepper. Stir until everything is combined and slightly thickened. 4. Pour dressing over salad and toss to combine. Top with freshly grated parmesan cheese and the pumpkin seeds. Stop into Powell’s books for me??! I wish I was going; haven’t been to Portland in years. We always stick to the coast now when we are travelling or burn right through to Roseburg where my family is (Southern Oregon). Don’t worry, Linda. I stop into Powell’s is a definite requirement! Have lots of fun and don’t forget to drop us the details when you get back. Oh, and don’t forget the pictures, too! Sounds like a swell trip! Have fun! Thanks Rorie! It was a great trip and I’m glad to be back. Purplecupcake, pictures are on the way! have a great time in Portland! I lived there for 4 years and I really miss it! Thanks Gemma, Portland was wonderful as always!